The weekend was a mix of highlights and lowlights. I was thrilled I got the opportunity to meet some lovely local bloggers (Kate, Lucy and Sarah). They are a total blast to be around and I hope we get meet again soon! Do you follow them? But...in other news the beloved 49ers sadly lost at the Superbowl. Yes...I know most of you don't really care one way or another, but SF was in a state of mourning. I haven't felt the hype die down so fast like last night! The Quest for Six will continue...(I have my ode to the team below...and what I wore after this outfit for the game...) Nevertheless, I did have a good time and also enjoyed watching the game and the halftime show. Did any of you catch the Beyonce concert? I love the texture and color of that skirt! I am totally going to try and pair a nicer skirt with a tee now. Looks great! I spent the day painting and thus missed the superbowl, but I'm honestly not much of a football fan anyway. I LOVE that skirt, the color is so beautiful! I love that skirt! I wanted to get it so badly but it just didn't fit me right. It looks great on you though! Yes,yes, definitely mourning. We were so close!!! Love this look btw. Great play on layering necklaces. I also need that sweatshirt in the last pic. So vintage-y. That last picture of you is too cute! Love your necklace and top! Your hair and sunglasses combo looks adorable- such a fun look! Love that t-shirt and your hair looks fabulous!! those sunnies look fab on you. i'm loving this outfit - the shirt with that skirt & leather jacket is perfect. cute look love the necklace. I am loving the tee with this skirt, and your jacket tops everything off perfectly. It sounds like a really fun weekend, even if the 49s lost. What a crazy game though! hahah your last picture is soo amazing. I'm so sad I only got to see the last 30 seconds of Beyonce's show last night :( But I saw bits and pieces of the game, how disappointing :( It was such a close game!! And I am so glad our little lunch date turned out great :) I hope to see you again soon! that skirt is gorgeous!! Love the color :) and that necklace is super pretty too! haha nancy! i love your san francisco gear. 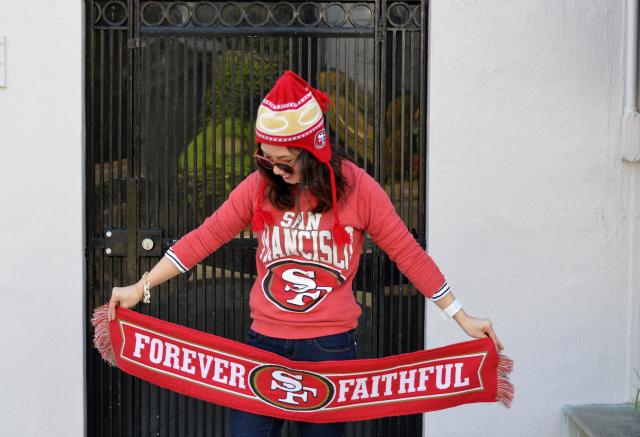 i have a couple of blog readers that are from san francisco and i felt for you guys. i must say, they did try and come back. only if they had more time. great accessorizing in the first outfit. I'm loving the mix of casual and glamour in your outfit! I love pairing a t with a more dramatic skirt. The texture of it is gorgeous, and I also love the statement necklace! We were rooting for the 49ers too! Such a disappointment...they came back and fought in the second half too...sigh. Such a cool look! The metallic oxfords are awesome:)! That tee is my fave - and you styled it perfectly with that gorgeous skirt! LOVE your SF outfit as well...too cute...sorry they lost! Wow, you look lovely ♥ and full of style!!!! Adore it! Blogger meet ups are SO much fun! I will have to check out their blogs. and I love this out - your shoes!!! Love. cute outfit! love the necklace! edgy meets glam....LOVE! Although there are so many textures and elements to your look....it all works perfectly together! 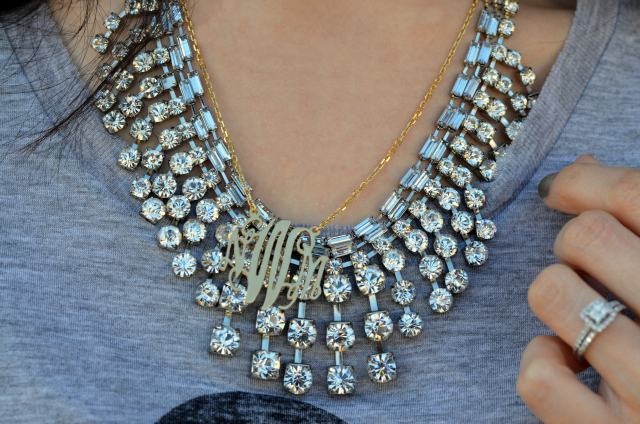 I really love the look of a statement necklace paired with a simple tee - so cute! SF LOVE! Such a heartbreaking loss but I'm still so proud of our boyz.